A man who was already serving time in prison for committing a grievous crime, has shocked people by engaging in yet another criminal act. Some alleged Lagos fraudsters, led by an inmate at the Kirikiri prison, Alhaji Lukman Adewale, have destroyed the expectation of a new Lagos couple to have a roof over their head after their wedding. According to Punch Metro, the couple and 11 others, who had paid different sums of money for some apartments on Adekujo Street, Alakuko, were allegedly defrauded to the tune of over N1m. It was learnt that Adewale, who is facing criminal charges for alleged fraudulent sale of a house, reportedly called his apprentice, Adeniyi Owolabi, and asked him to position himself as an agent in charge of the house. Owolabi, 45, allegedly collected money from 12 people, promising to allocate them apartments in the house, which was under construction. The suspect was said to have given the victims a date to come for their keys, when the house would have been completed. The victims on the appointed day reportedly discovered that the apartments had been occupied and they had been duped. The matter was reported to the police at the Alakuko division after the suspect fled the area. During investigation, the police were said to have discovered that the fraud was initiated by Adewale, who owned up to the crime and assisted the police in the arrest of Owolabi. A relative of the new couple, who did not identify himself, said they now lodged in a hotel. A victim, Abatan Abiola, said he paid N70,000 as part-payment for a room-and- parlour apartment, adding that the suspect asked him to come for the apartment keys on March 16. He said, “He said he was the agent in charge of the house. In order to have evidence, we videotaped him while he was collecting the money. “He said I should come for the house keys on March 16. But to my surprise, I met five other people in the house, laying claim to the same apartment. While we were arguing, other victims joined us and the number grew to 12 persons. He had collected over N1m from us. Abiola said he was not interested in pursuing a case against the suspect, adding that he only wanted a refund. A house agent, Amos Afolayan, said he took three people to the suspect. Afolayan explained that his clients paid Owolabi N300,000, N230,000 and N100,000, for a two bedroomed flat, a flat, and a room-and-parlour apartment, respectively. He said, “He told us he was the agent in charge of the house. I observed that the top floor of the house was still under construction, while a part of the ground floor had been completed. My clients paid the rents, including agreement, commission and caution fees. When we went to take possession of the apartments, we learnt he had fled. The completed apartments had been occupied. “Before now, he had given us the contact of his boss, Adewale. Anytime we called Adewale, he would say he was in Ilorin, Kwara State. At another time, he said he was sick and had a surgery. He said he was recuperating. He usually picked our calls. If he missed a call, he would return it. Punch Metro reports that during interrogation, the lawyer confessed that he was fake, adding that he met Adewale during a visit to a relative in the Kirikiri Medium Prison. The Investigating Police Officer and some officials were said to have confirmed that Adewale was indeed in prison. “When they visited him in the prison, he told them he didn’t collect any money from Owolabi. 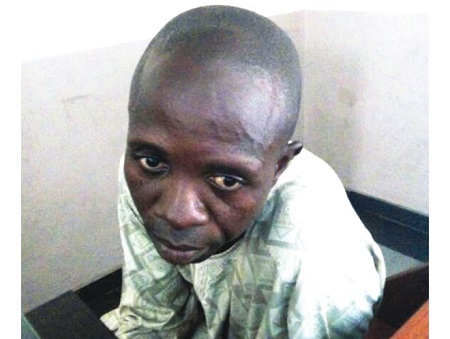 He promised to help the police track the suspect,” Afolayan added. Owolabi, who spoke with our correspondent, said his boss tricked and handed him over to the police. He said, “The house in question used to be a school before the owner decided to convert it to a residential building. She asked my boss to develop the building because she didn’t have money. My boss was on the job when he ran into trouble. He is in the Kirikiri prison because of a house he sold. “He called me from the prison that I should take over from where he stopped. He has a phone with which he calls people. Some of those that my boss had collected money from before forced themselves into the house and that created a problem for me. A top official of the Nigerian Prisons Service, Lagos State Command, who asked not to be identified, denied that Adewale was the brains behind the fraud. The Police Public Relations Officer, ASP Olarinde Famous-Cole, promised to react to the case after being brifed by the division. It was, however, learnt that the police arraigned Owolabi before an Ogba Magistrate’s Court on 10 counts of fraud and stealing. The charges stated that the defendant allegedly defrauded five people. The charges read in part, “That you, Adeniyi Owolabi, on March 7, 2017, at about 8am on Adekujo Street, Alakuko, Lagos, in the Lagos Magisterial District, did fraudulently obtain the sum of N300,000, from one Oketokun Tolulope, on the pretence of securing him a two-bedroomed apartment, knowing same to be false, thereby committing an offence. The police prosecutor, Inspector E. Ayorinde, said the offences were punishable under sections 312 and 28 of the Criminal Law of Lagos State, Nigeria, 2011. The defendant pleaded not guilty and elected summary trial. His counsel asked the court to grant him bail in liberal terms. The Magistrate, Mrs. Temitope Oladele, granted him bail in the sum of N250,000 with two sureties each in like sum. The case was adjourned till April 21, 2017. 0 Response to "See the Man Who Duped New Couple, 11 Others of N1m While Still in Kirikiri Prison (Photo)"